A mesotherapy-inspired gel mask fusing three forms of hyaluronic acid with a trio of vitamins to hydrate, brighten and revitalize the skin. ...MÉSOFORCE HYALURONIC ACID VITAMIN C MASK is designed to deliver the same rehydrating, plumping, smoothing and brightening effects as traditional mesotherapy, via topical application. 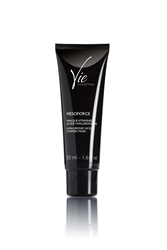 Vie Collection reasserts its cosmeceutical prowess with MÉSOFORCE HYALURONIC ACID VITAMIN C MASK, a high-tech mask inspired by mesotherapy - a treatment approach in which hyaluronic acid, vitamins and antioxidants are injected just beneath the skin’s surface to hydrate and revitalize the skin. Formulated with three forms of hyaluronic acid and a powerful vitamin trio, MÉSOFORCE HYALURONIC ACID VITAMIN C MASK is designed to deliver the same rehydrating, plumping, smoothing and brightening effects as traditional mesotherapy, via topical application. High Molecular Weight Hyaluronic Acid - Hyaluronic acid, a natural component of the extracellular matrix, plays a key role in the structure and organization of the dermis. Helps maintain optimal skin hydration by trapping water in the skin’s deeper layers, as would a sponge. Strengthens skin cohesion and firmness. Low Molecular Weight Hyaluronic Acid - Hyaluronic acid with a molecular weight between 15,000 - 50,000 daltons easily penetrates skin layers. Limits transepidermal water loss (TEWL) by strenghtening the skin’s tight junctions, reinforcing the skin barrier. Swells on contact with water to fill out fine lines related to dehydration and lifestyle (smoking, sun and pollution). Encapsulated High Molecular Weight Hyaluronic Acid - Encapsulated in spherulites, multi-lamellar microvessicles that easily penetrate the skin and gradually open for controlled release. Expands on contact with water in the dermis to add volume to hollow areas and fill deep wrinkles. Vitamin C - revitalizes and reactivates the biological functions of the skin. Boosts collagen synthesis to reduce fine lines and wrinkles. Re-energizes cell metabolism, traps free radicals and prevents skin aging. Revives skin radiance. Vitamin B5 - a constituent of Coenzyme A, plays a key role in cell metabolism. Enhances skin hydration, hydrates the deep layers of the dermis, stimulates epidermal differentiation, restore’s the skin’s barrier function and improves the skin’s appearance. Vitamin E - Lipophilic and anti-free radical. Protects cells and skin tissues from premature aging by acting as an anti-oxidant shield. Frees the skin from dullness. *Satisfaction test conducted on 23 women after the 1st application. **Measurement of the level of hydration by corneometry® on 11 volunteers after a single application. ***Satisfaction test conducted on 23 women after 2 applications per week for 28 days. As a cosmeceutical expert in the spa industry, Vie Collection is a high performance, high-end skin care line focused on bridging the gap between traditional cosmetics and esthetic medicine. We are one of few spa brands with our own laboratory which allows us to always be on the cutting-edge of scientific progress in cosmetics. We offer in-spa solutions for a spa-savvy clientele that seek medical results but prefer the use of topical products. Vie Collection has targeted, non-invasive and clinically proven alternatives and complements to the top five cosmetic medicine procedures available today. With the partnership of a prestigious French esthetic doctor, Vie Collection brings expertise, authenticity and real results in the form of expert formulations and treatments, from the finest ingredients.